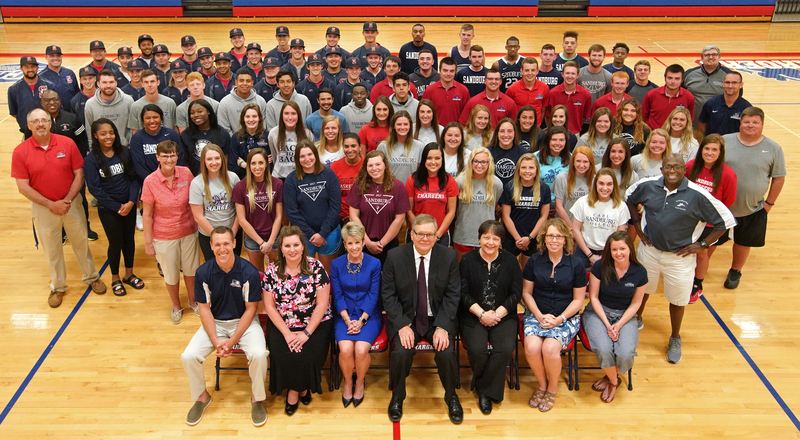 On the strength of one of the best overall seasons in the history of Carl Sandburg College athletics, the Chargers have repeated as winners of the Arrowhead Conference All-Sports Award. Sandburg, which won the award for the first time last year, defended its title behind a 2017-18 season that saw it finish in the top half of the standings in every conference sport. The Arrowhead Conference All-Sports Award is determined by calculating the percentage of teams a school finished ahead of in the final standings for each of the league’s six sports (volleyball, men’s basketball, women’s basketball, baseball, softball and men’s golf). Sandburg finished ahead of 78 percent of conference opponents during the 2017-18 season (compared to 71 percent in 2016-17), putting it well ahead of second-place Highland’s 66 percent. Black Hawk (47 percent) was third, followed by Illinois Valley and Sauk Valley tying for fourth (44 percent) and Kishwaukee (16 percent) in sixth. Highlighting the year for the Chargers were Arrowhead championships in men’s basketball (its first since 1990) and baseball (first since 2008). Sandburg also had runner-up finishes in volleyball, softball and men’s golf. Women’s basketball had a third-place finish after winning the Arrowhead title each of the previous two season. The Chargers had a winning conference record in each of the five sports whose standings are determined by wins and losses. Men’s basketball went 9-1, baseball 16-4, volleyball 8-2, softball 11-9 and women’s basketball 6-4. Together, those teams combined to go 50-20 — a .714 winning percentage. The Chargers’ success extended beyond conference play, too. Volleyball advanced to the NJCAA national tournament for the first time in program history, and women’s cross country freshman Ashlyn Boyer competed at the national meet. Men’s golf, which will play at the national tournament May 21-24, is marking the sixth straight season and 10th time in the last 11 years the Chargers have sent a team or individual to nationals.